Finally able to Bookmark it now it's back up. We did once. But it was too crowded. Four people is hardly crowded in my books Besides, I am sure if you had asked nicely, you could've'd that king-sized bed all to yourselves. His eyes did what, now? *checks* Well, I'll be. From brown eyes to blue. "Don't it make my brown eyes bluuuuuueeeee...."
I doubt either one of you wanted to go anywhere near it, gents. Oh, wait, I know why his eyes turned blue. The white walkers got him. Either that, or he's been eating the Spice. Can it be both? Let's say it's both. A Herbert-Martin crossover would awesome. Or terrible. Or both. Let's go with both again. Totally random thought: It would be interesting if this entire comic were told without words. That'd take some serious visual/storytelling chops, but the ambiguity would leave all sorts of narrative possibilities open. I doubt if that's where this is going, but it would be neat. No no no. Read the book. The book! So now we have an explanation for what the young lady was doing on top of the wind generator. Still don't know what Change-Eyes is up to, though. Okay, okay. The book. I'll put it on the to-read list, behind "The Amazing Adventures of Kavalier and Clay," which I just started, and the other book I picked up with it. His eyes went from brown to blue and her hair went from red to yellow. Strange things are afoot in the Grove. The Wind Turbine you filthy minded people you! We have a wind turbine plant nearby. When I was commuting, I frequently wound up behind parts of them on the highway. When you go up to service one of these, you go up an elevator through the base, ending with a climb up a steep ladder-like stairwell through the base pivot into the generator housing. Maintenance is done from the inside; no one is on top of these things, they're over 300 feet (about 100 meters) tall! The only time someone's on the outside is during construction. Okay, Carl's post made me realize there is something I hadn't mentioned, because I had subconsciously assumed everyone thought the same as me. Does anyone else feel like the world is slightly... I dunno... supernatural? It feels a bit like a dream sequence, with the unimportant parts filed off. It reminds me of xkcd's "Time" (a movie I yet have to watch, by the way). The title of the comic seems to reinforce that - Alice Grove sounds like a "special" place, akin to "World of Amelie" or "Sophie's World". Such a world need not necessarily operate on the same principles as ours. For me it's more that it's pared down, simplified if you like. But we don't yet see what else there is in this world which in time we will assume as a background for what we see in-frame. Jeph is starting it very differently from the start of QC. Whereas QC began as (and largely remains) a gag-a-day comic, here we have three initial strips which are entirely scene-setting in preparation for whatever interaction will shortly occur. 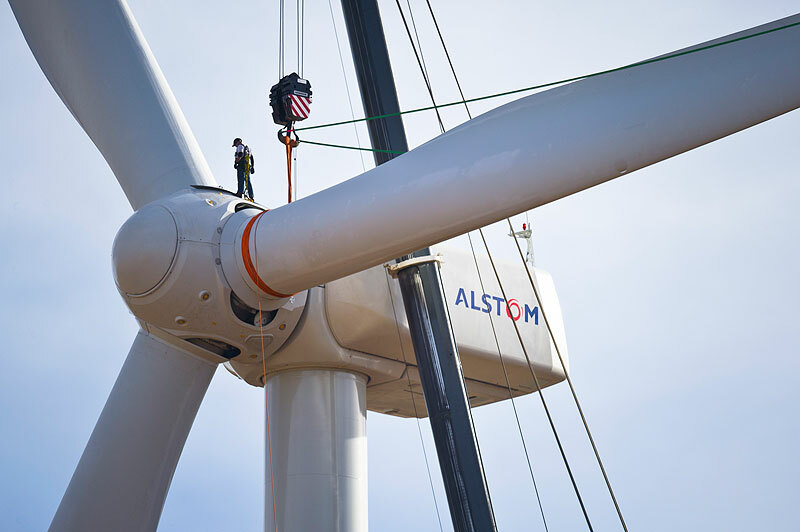 Wind turbines come in many different sizes. Edit: Here is a photo of the Viking fortress Trelleborg. Also visible in the picture is a farm that was until recently owned by relatives of mine. The wind turbine you see looks much like the one in the comic, but it is smaller. There is certainly no room for an elevator inside. I have never seen it serviced, but my guess is that the technician would stand on a lift. Some are growers and some are showers. however, size does not matter. Also, I'm not in RELATE, am I? One annoying thing I noticed is that the page numbering is the wrong way. Every time a new page is added, the number of the previous pages increases by one. Now the first page has number 3, soon it will have number 4. The URL's end in /3 for the first, /2 for the second and nothing for the first. So it seems that the pages are counted from the latest and backwards. I'm a little surprised that Jeph used Tumblr as the host rather than adapting his own well-established code used for QC. Technically, those aren't the URLs for the comics themselves, they're the URLs for the pages, and he's got it set to 1 post per page. The permalinks start with http://www.alicegrove.com/post/98389994494 for the first post. I have to say that I really like the style of this comic very much. The art, the layout with the lovely big background panels (especially since these are outside and have a different perspective from the usual QC middle close-up shots), the set-up of the action without words... The only downside is that due to it only updating twice a week, it will take ages for the story to advance (yes, I am impatient). I know that this layout with very little action is precisely what I complained about with regard to QC (when it came up in QC), and I stand by this: QC is a gag-heavy story with lots of talk and characters where it is extremely annoying to have little action in one comic, but with Alice Grove (do we abbreviate it to AG yet?) I find it fits. It really seems to be a very different comic to QC. Loki: Yeah, I also get this slightly otherworldly feeling, although so far it really could just be set in our universe. I'm probably dating the hell outta myself, but I see the title of this comic and this goes through my head on repeat. The rest of the comic is a flashback as Alice sees her entire life flash before her eyes as she falls to her demise. And just before she hits the ground she wakes up and it turns out she's Pizza Girl. Oh, snap! This is getting interesting very quickly.... and his eyes are brown again. My first thought was: Shouldn't she be using 2 ropes to avoid disaster if one breaks? "And that's why it's called Alice Grove. Her death affected people all around this here grove." How did she get the rope up there in the first place? This wind turbine is big enough to have a ladder on the inside. Why did she not use it? Proper climbing ropes just do not snap like this. This is not rapelling, as she is hanging from the end of the rope. Ergo, there must be a remote-controlled winch on the top of the turbine. This is certainly not an approved maintenance activity. Was Alice sabotaging the turbine? It seems the man on the ground was in a hurry to warn her to get away. I guess the police are on their way? Prediction: This is a nightmare sequence. The woman died, the man has nightmares in which he tries to save her and fails. Today's comic is already pulling hard at my suspension of disbelief - this is just not how climbing/ abseiling accidents happen. Unless you're a complete idiot and really careless (and I don't like to think that of Alice, who I think does this professionally as well, because amateurs usually don't climb turbines) you will check your rope for structural weaknesses and, especially if you're a professional, regularly exchange it for a new one even if no tears or frailties can be seen. Since one is today able to produce extremely reliable ropes, this makes today's scenario in the comic very unlikely - unless it is a special feature of the Alice Grove universe that they can't produce structurally sound ropes. The climbing accidents that do happen are mostly due to people doing their knots wrong, forgetting to tie themselves in properly due to being distracted (!) or not being able to use their abseiling equipment correctly, not to speak of them falling on rocks/ against the wall, avalanches and the like, which can't happen when climbing a turbine. Intriguing theory. I could really see this to be the case. 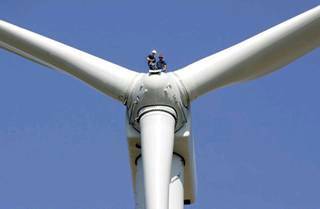 Although in this one, he sort of causes the accident - if he hadn't arrived flailing his arms widely at her, she just would have stayed on the turbine, and maybe would have come down later in a less hasty fashion, which maybe would have avoided the accident. stephber: Yeah, maybe the girl isn't Alice. Doesn't really change anything for me, although I guess it would feel like a letdown to lose the naming character so early in the comic and less so if she was only a side character - I kknow this is mean and irrational. Edit: I actually don't think this accident will be fatal. And I still think it is in fact Alice. If this accident is not fatal, it will be a miracle indeed, assuming it takes place in a universe with the same physical laws as ours. Unless it is a place with significant lower gravity, such as a small planet or a space habitat. But the blue sky suggests it is happening on Earth. Besides, a space habitat (or a pressurized dome on a small planet) would not have much wind, so a wind turbine would be useless. I also think this is Alice. This may be how it ends. The rest of the story is just flashbacks from the man down below's point of view.